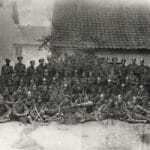 By the summer of 1916 twelve battalions of the Gloucestershire Regiment were on the Western Front. 1st and 10th Battalions in 1st Division; 1/4th, 1/5th and 1/6th in 48th (1/South Midland) Division; 2/4th, 2/5th and 2/6th in 61st (2/South Midland) Division; 8th Battalion in 19th Division; 12th Battalion in 5th Division; 13th Battalion in 39th Division; and 14th Battalion in 35th Division. The Gloucesters were fortunate to not have been in action on the first day of the battle of the Somme, when the British Army lost over 19,000 men killed and another 40,000 wounded. But the battle was to continue, relentlessly, with periodic flare-ups, for another four and a half months, by which time British and Empire losses in dead alone had gone beyond 95,000 on the Somme Front. And yet, the British Expeditionary Force of 160,000 that had gone to war in 1914 was, by the end of 1916, over one and a half million strong, nearly a quarter of million of them being Empire troops from Canada, Australia and New Zealand. “Just a line to tell you how things are going. This fighting has seen some changes in officers & men, all good comrades, killed, wounded or missing have gone from us & our hearts are heavy with their loss. “Major Coates died splendidly at the head of his men & after he was hit cheered them on continually till he died. With all his faults we mourn a keen & brave soldier. “Paramour, who was attached to us & who was commanding A Coy, the men say was magnificent, walking about arranging things as if on the barrack square though the ground was literally boiling all round him with machine gun fire. I have never taken such a fancy to a man so quickly; he was only 20, a perfect gentleman & one of the most gallant fellows I ever knew. “Smith, poor fellow, has died of wounds. I passed him on his way down – though hit in seven places, his courage was wonderful. I asked him how he felt & he said with a smile “There is some lead in me which ought not to be there & I am afraid I have done in your tunic. I am awfully sorry”. I had lent him my old tunic as since he had his commission he had not been able to get leave & get his kit. “Elliott too died finely, leading on his Coy. Three other Officers are killed. During the fight the Colonel & I had some providential escapes. There were at least 4 direct hits on the dug-out we were in but no one was hurt. The candles were continually going out & once when we were out in the trench a 5.9 landed about 5 yards away. “. . . who was killed in France on July 29 in an heroic attempt to get his platoon officer, who was badly wounded, under cover. “Private Griffin was in his 20th year. He was employed by Messrs. R.A. Lister and Co. before war broke out, and enlisted in “Bristol’s Own” on Dec 27 1914. This young hero bore the reputation of being a brave and fearless soldier, and was greatly liked by the officers and men of his regiment, by whom his death is greatly regretted. “I am writing to you on behalf of the platoon of which your son, Pte NF Griffin was a member, to express to you their deep sympathy on the loss of your son. I can assure you that we have all felt his loss most acutely, as he was quite one of the most popular boys in the company. Picture: Soldiers of 1/4th Battalion on the Somme with captured German equipment.